Roast the papads in microwave or on flame as per choice. Crush them into small pieces using your hands and keep them aside. Next, dry roast the poha till its raw taste disappears and keep it ready. 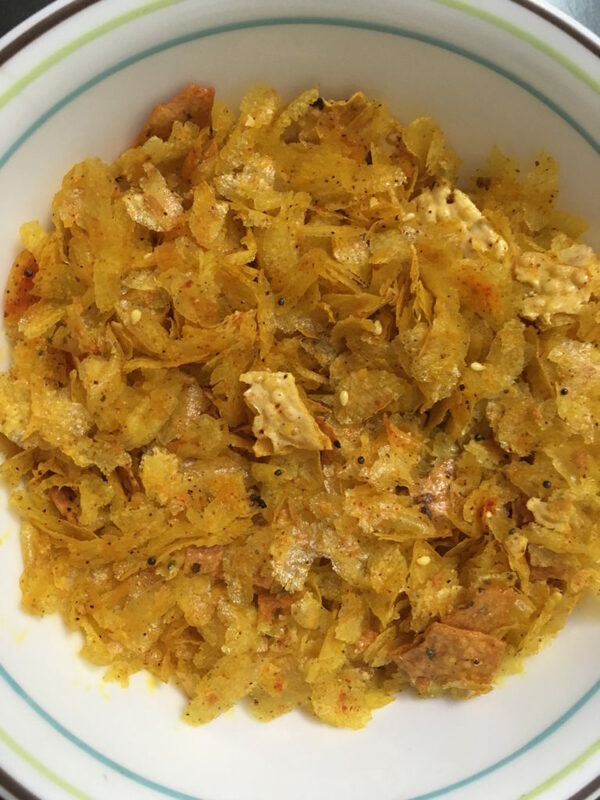 Temper the oil in a kadhai with mustard and sesame seeds and once the seeds start spluttering, add the crushed papad to the hot oil. Fry it a bit for 15-20 seconds till the papads take in the oil. Add turmeric and chilli powder to the oil and mix it well. Immediately, before the masalas in the oil burn, add the roasted poha in the kadhai and mix it well. Add salt and sugar and again mix it well. Note: I have never used any other brand of papad except Lijjat. It tastes best with Lijjat.